During the 2nd International Sustainable Energy Summit (ISES) 2014 last week, SEDA Malaysia was expected to announce the renewable energy (RE) quota for this year. 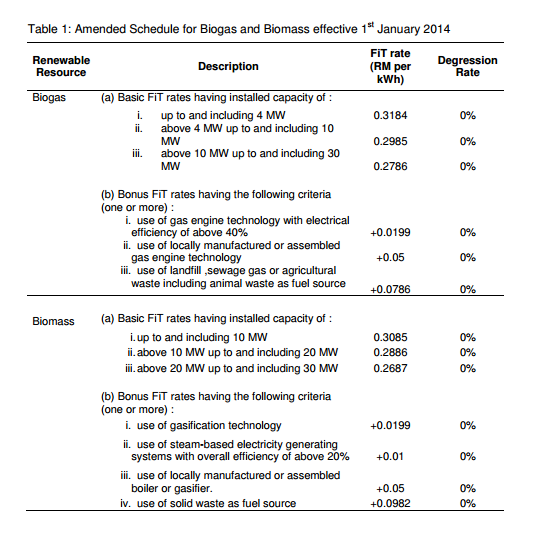 It was deferred, but there was an equally interesting announcement, which touches on the new rates of bonus and degression for three RE sources - Biomass, Biogas and Solar PV. This is to encourage take-up rate of biomass and biogas which has seen slow response. Increase of bonus rate for use of locally manufactured or assembled gas engine technology (biogas) and use of locally manufactured or assembled boiler or gasifier (biomass) from RM0.01 per kWh to RM0.05 per kWh for both technologies. Note: These new degression and bonus rates are effective from 1st January 2014. Degression rates adjusted to 10% across the entire Schedule, except for the bonus criteria of locally manufactured or assembled solar PV modules and solar inverters. For the two bonus criteria, degression rates are retained at 0% and their bonus rates adjusted from RM0.03 per kWh (solar PV modules) and RM0.01 per kWh (solar inverters) to RM0.05 per kWh for each of them. 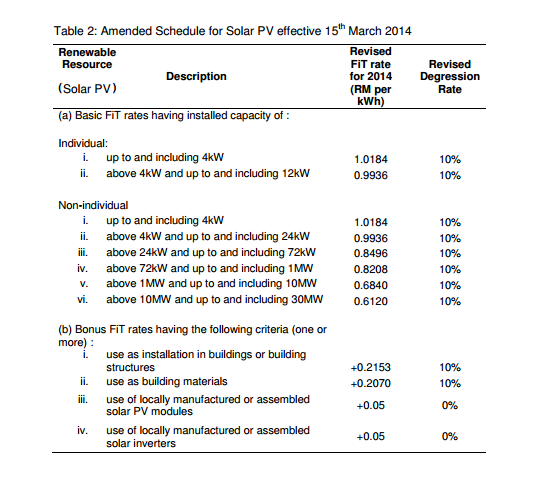 Note: The new degression and bonus rates for solar PV are effective from 15th March 2014. For complete reading of the press release, visit here.